The Chicago Blackhawks ended the first half of their 2018-19 season after their Dec. 29 overtime win against the Colorado Avalanche. Though they finished the first half on a high note, their season has been far from successful. There are still many positives but a lot to work on. However, some members of the Blackhawks have stood out more than others over the past 41 games. At the start of the season, I argued that a comeback for Saad was essential if he wanted to remain in a Blackhawks sweater. With 11 goals and 11 assists in the first half of the season, especially when compared to his 18 goals and 17 assists over the entire 2017-18 season, it’s safe to say that Saad is having a successful comeback. He didn’t have the best start, as it was rumored that he was going to be a healthy scratch back in October. Since then, though, he has become one of the most active forwards on the Blackhawks, coming in fourth overall in goals and points. Prior to his concussion in mid-December, Crawford was playing well. It’s not obvious when you look at the stat sheet, but he can only do so much when it comes to how poorly the Blackhawks’ defense has been this season. Teammates have praised him for his performance this season, as defenseman Duncan Keith told the Chicago Sun-Times, ‘‘He’s been great. He’s been everything that we could ask from him. 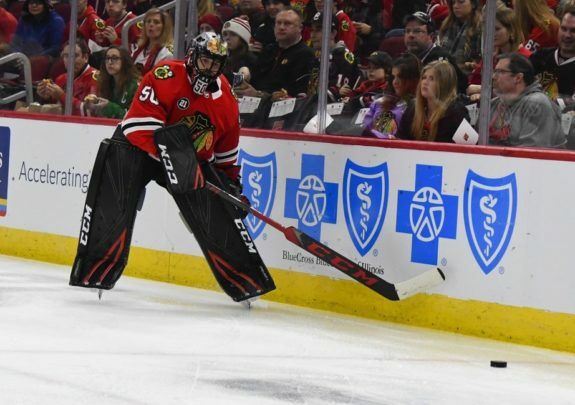 We definitely don’t give our goalies much support out there,’’ (from ‘A difficult question: Will Blackhawks goalie Corey Crawford ever play again?’, Chicago Sun-Times – 12/17/18). Keith’s words echo the same sentiment of Blackhawks fans and commentators. With the defense playing so poorly, Crawford deserves much more credit than he gets. Although he hasn’t been completely consistent this season, DeBrincat’s performance improved greatly when former linemate from the OHL’s Erie Otters, Dylan Strome, arrived. With 18 goals and 15 assists in 41 games, DeBrincat is third overall in goals and points amongst his teammates. 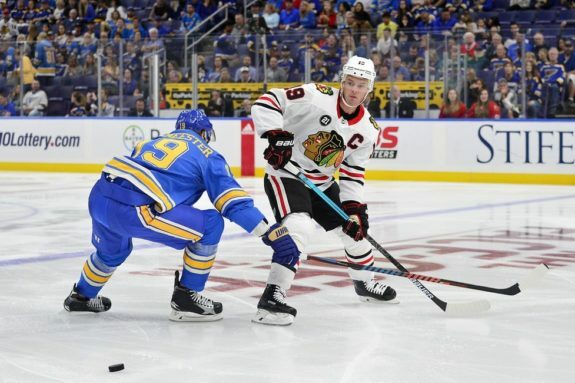 He is modest about his luck so far this season, as he told the Chicago Sun-Times, “I’ve been getting pretty lucky lately with the puck bounces, but you go through stretches like this, and then you go through stretches where you can’t buy a goal,” he said. “I just put them in when I can.” (from ‘Blackhawks’ Alex DeBrincat heating up, outplaying rookie season’, Chicago Sun-Times – 12/26/18). If DeBrincat keeps playing at his current pace, he will no doubt help the Blackhawks as a team, but help cement himself as a stronger player overall. Like Saad, a comeback was necessary for Toews this season. As the quarter of the season mark passed, it was obvious that he achieved his goal. With 16 goals and 19 assists in 41 games, he is second overall in goals and points among his teammates. Compared to his 20 goals and 32 assists in 74 games last season, Toews’ improvement is as clear as day. Earlier in the season, Toews played on the same line as DeBrincat, who praised him as a strong leader to the Chicago Sun-Times, “He’s a really smart player. He’s conducting everything out there. He’s putting the puck in on nice plays. He’s been great for us obviously this season so far. He’s really gone to the net and gotten a few dirty goals. Obviously, that helps us as a line. We can move it on the outside and get the puck to the net when we’re in trouble,” (from ‘Blackhawks winger Alex DeBrincat off to fast start playing with Jonathan Toews’, Chicago Sun-Times – 10/10/18). Toews playing well again is a huge relief for Blackhawks fans in a difficult time. If more teammates follow suit, the season might not be a lost one after all. With 22 goals and 28 assists in 40 games, Kane ranks first overall in goals, assists, and points overall for the Blackhawks. In the league as a whole, Kane ranks seventh overall in points. With a seven-game point streak and his consistency throughout the season, he’s on track to possibly win the Art Ross Trophy for the second time in his career. Despite the Hawks having a rough season, Kane is playing like the superstar he is. After turning 30 earlier in the season, he told the Chicago Sun-Times that he doesn’t see himself hanging up his skates anytime soon, “It’s pretty crazy how time flies, but I think 30 is still fairly young, especially in today’s game. You see a lot of players in today’s gameplay into their 40s, as well, so just try to maintain what I’ve got going right now and keep it going as long as I can. But I still feel fairly young. . . . 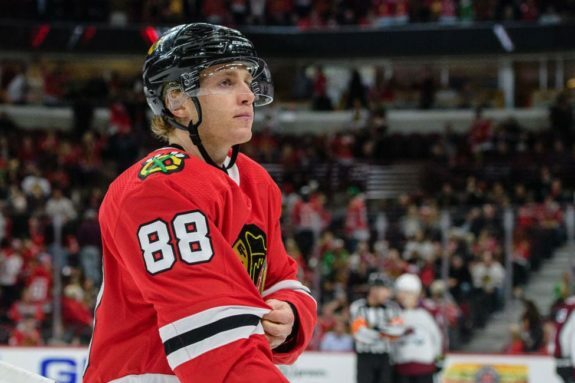 I still feel like I’ve got a lot of hockey left.” (from ‘Blackhawks’ Patrick Kane on turning 30 — and possibly playing into his 40s’, Chicago Sun-Times – 11/17/18). Kane’s consistency is keeping the Blackhawks from the bottom of the rankings. If he continues his point streak, he may very well be essential in earning a possible playoff spot.